Short of time and looking for one winter special meal out that ticks all the boxes? I highly recommend George Jardine’s daily-changing winter menu - tried it last weekend. I certainly go for the magnificent panoramic view and relaxed vibe, but Jordan Restaurant with George Jardine tops my list for exquisite food that sounds straightforward yet simply and understatedly knocks the senses into submission. The day’s menu could feature barrel-smoked tuna, followed by saucy braised veal frikadelle with roasted Jerusalem artichokes and Stellenbosch Ceps, to homemade ice cream or baked malva-style puddings. Meal highlights on the day: 1. 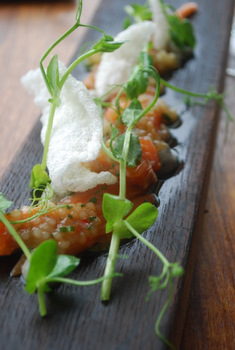 Hot-smoked Franschhoek trout with dots of charred aubergine puree, and sago – served as tangy sago vinaigrette and then as crunchy sago chips similar to fried Indonesian prawn crackers. 2. 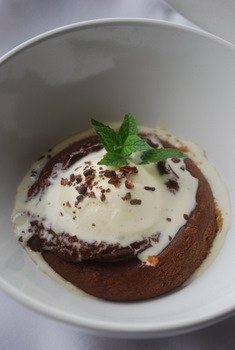 Utterly delicious Valrhona chocolate hot pot with homemade vanilla icecream. A spongy mass with bittersweet French chocolate oozing from the centre. To drink: Jordan barrel-fermented Chardonnay 2009 – delicious with the trout starter - and Jordan Prospector’s Syrah 2008 with rich braised veal frikadelle. It was even fine to take along our little guy. See Cape Winter Specials list 20110.